No, seriously, you don’t need the bottle (or the wine, but I’m not judging) – just the cork. Wine corks have become my absolute favourite, numero uno, best of the best, go-to resource when it comes to making play or doll food for my kids (if you’ve read the previous article on play-food sliced mushrooms, you’ll have scraped just the tip of my wine-cork obsession). Why do I love them? Well, they’re readily available (ahem), environmentally friendly (cork is a natural, biodegradable and renewable material) and extremely versatile. Basically, it’s dead easy to cut up! Is that a yummy chocolate cake and wedge of cave-aged cheese? 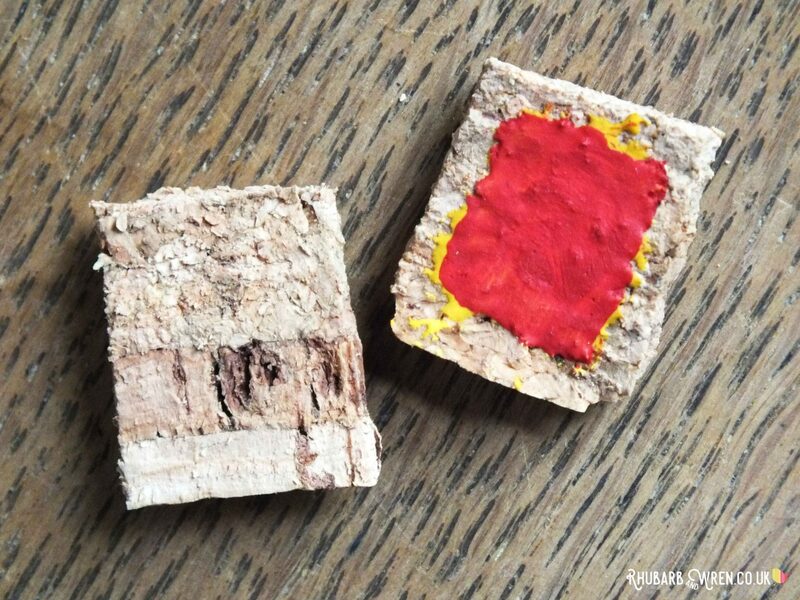 For our Maileg Mouse camp-out, we made a whole doll food feast of little mouse-bites out of cork. The kids haven’t stopped playing with them since, and the best part is they were both free and quick to make. Now, received wisdom says that you should soak your corks for an hour or two before cutting them up – this is supposed to make them easier to cut and less prone to crumbling. I wouldn’t know about that, as I’m far to impatient to bother with this bit of prep. 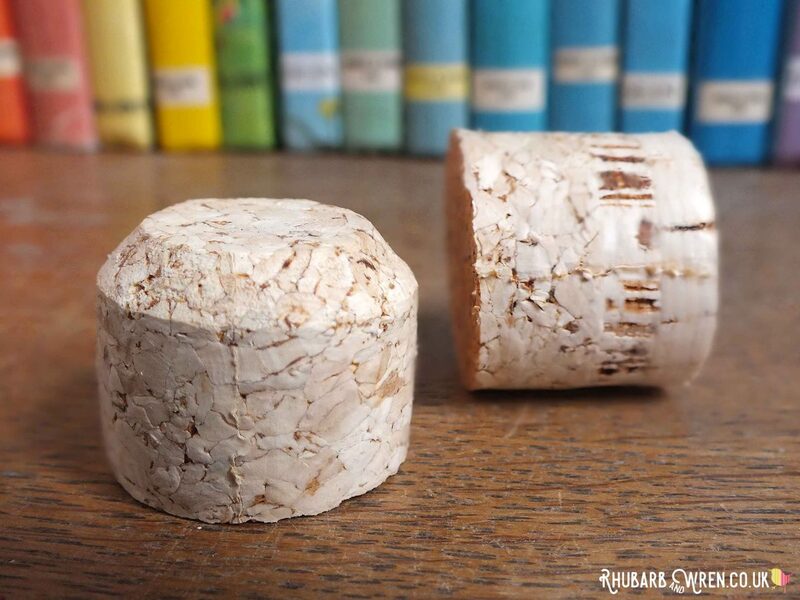 But if you’ve got particularly crumbly cork, you could give it a go. 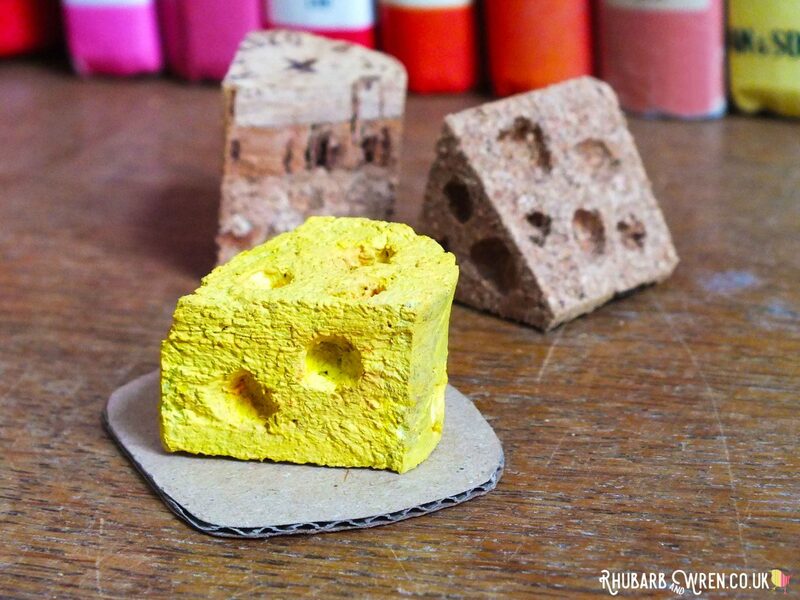 Using an old cork, or two, you can make a whole toy feast! 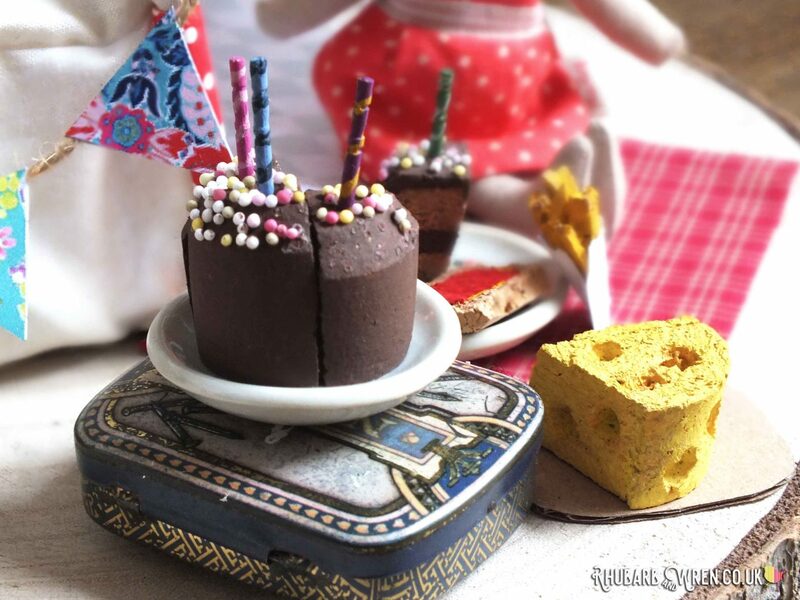 Once you’re ready to cut, to make our doll food starter (jammy toast), main course (a wedge of cheese with a side of potato wedges) and pudding (chocolate birthday cake), you’ll need one whole cork, ideally quite a big, chunky one. 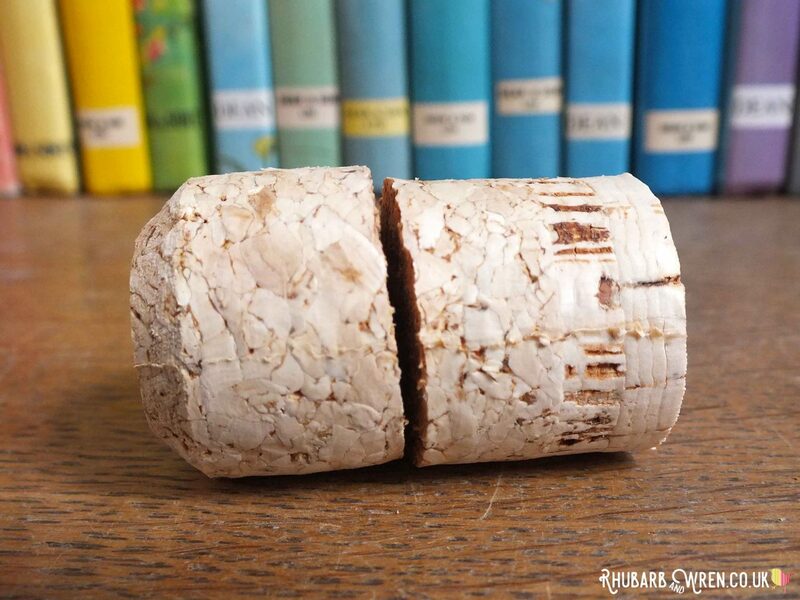 Step 1 – cut the cork in half. The two halves will be used for different food. Start by cutting this bad boy in half to make two roughly equal stubby cylinders. The top half will be your cake. 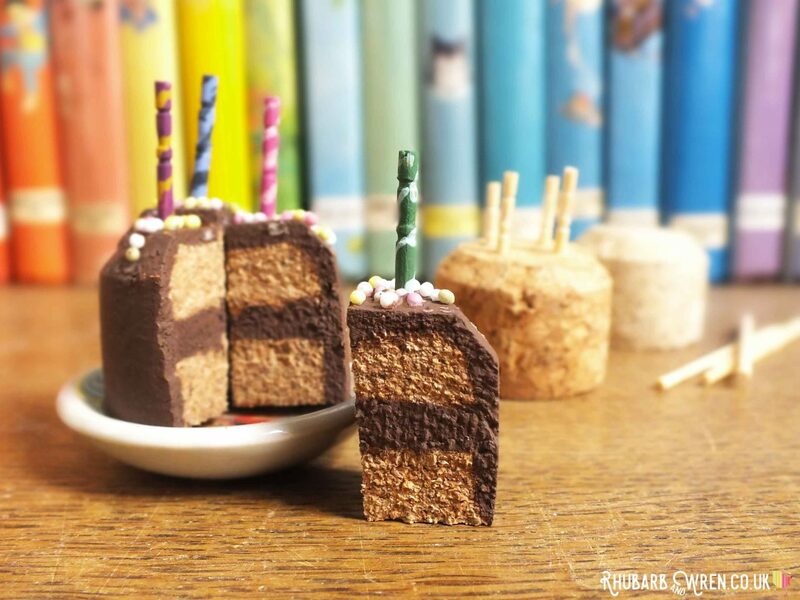 The top half of the cork is shaped just like a cake – all it needs are some toothpick candles! Paint it brown (or whatever colour you fancy for your icing). ​Dot on a few real cake sprinkles while the paint is wet for added cakey-ness. Cut into quarters. Or not – it’s your cake. As we like a layer cake in this house, I painted brown stripes on each wedge for the cake filling. 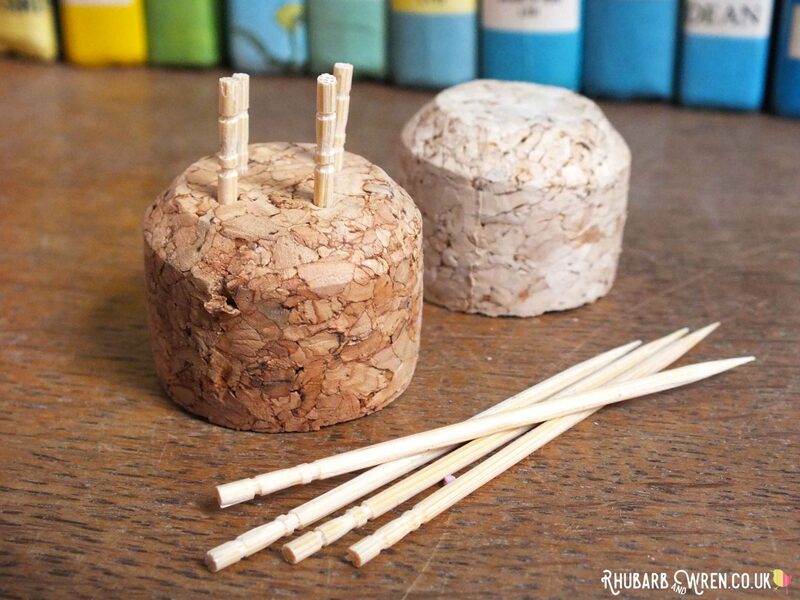 Stick in a few cut-down, painted toothpicks for candles, and you’re done! Paint your toothpick ‘candles’ in bright colours, and add a strip of paint to be the filling in your cake. Take the bottom half of your cork. ​Cut off the curved edges in three sections (save those sections! ), to leave a cheesy wedge shape. Carefully carve out a few ‘craters’ of different sizes on each side of the wedge. Paint yellow, et voila! You have a mouse-tastic chunk of doll food cheese. Maileg Mice like only the best and holiest of cheeses! Now for those sections cut off to make the cheese. Slice two of them into strips. Paint yellow. Aaannd you have a pile of chips/wedges/French fries – whatever you want to call them. I made a simple little paper bag to hold them using a rectangle of paper, folded in half. And I trimmed the open edges to a scallop shape, just because. 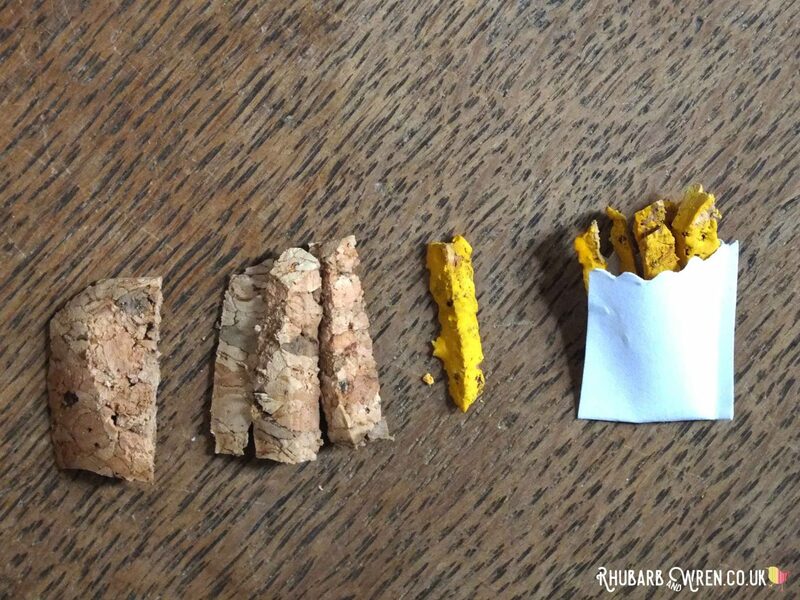 Use your offcuts of cork for a tasty pile of toy potato wedges! Note how it already looks a bit like a crust of bread. Slap on a bit of paint. I used yellow for butter, topped with red for jam once the yellow had dried. My kids don’t like butter, so I got told off for this – should have just done red! Jammy toast! Or perhaps the toys would prefer marmalade, honey or even Marmite? 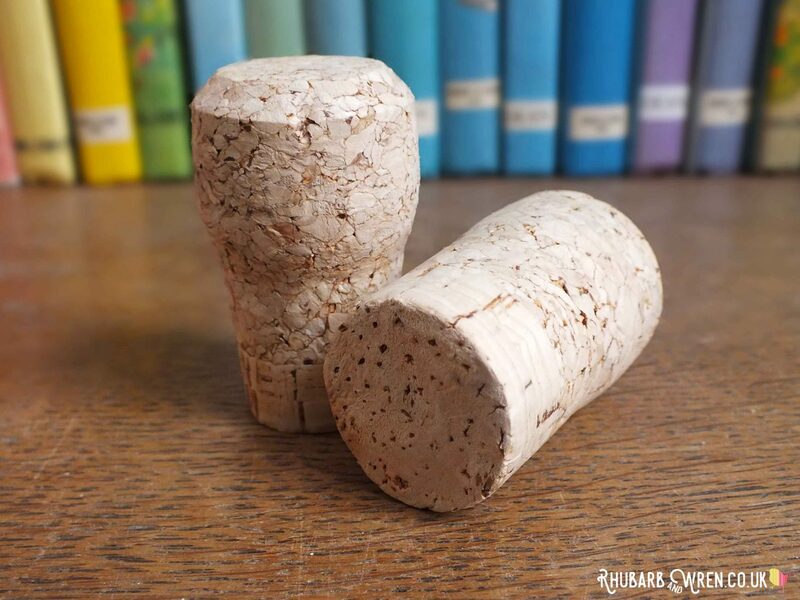 Cut a thick slice from your cork. Stick the cubes onto the pointy ends of toothpicks. Your marshmallows are ready to toast! 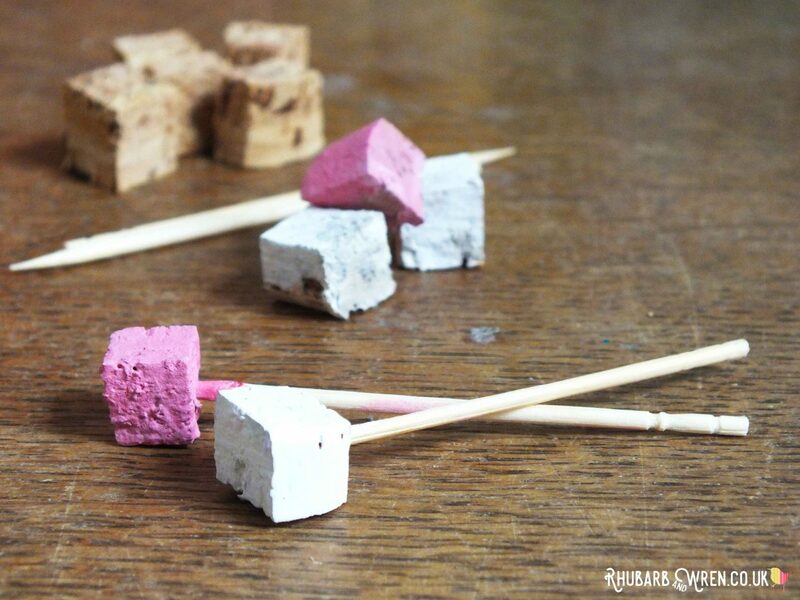 Squares of cork on a toothpick make great toy marshmallows. Cut out a circle of thick cardboard. Place an electric tea-light in the middle. Glue some pebbles around the edge. Cover the tea-light with twigs. Campfire. ​Make a tripod out of a few more sticks if you want. Once you start down this road, it’s hard to stop! 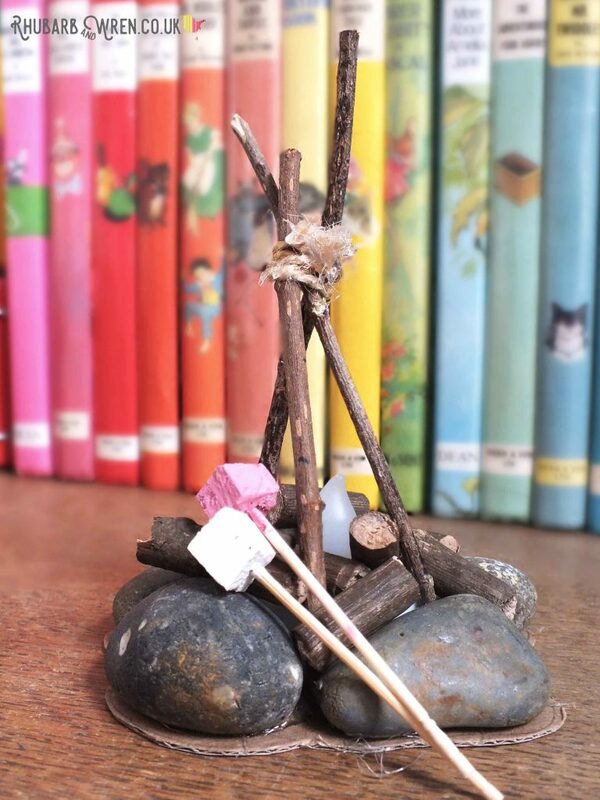 Mini campfire – made in ten minutes! The trouble with making bits of doll food like this is that once you start chopping up corks, you start to see their limitless potential. Why stop at yellow cheese? What about some camembert or blue cheese? That cake shape could just as easily be a pie – cut some strips and you can make a lattice over it. Take round slice and you’ve got a pizza. Or a cookie. Or an omelette. Glue a few thin triangles together and make a sandwich, or round slices for a burger. Odd shapes on a toothpick would make a kebab, orange sticks could be carrots, a triangular one could be a Toblerone (might have to try that one! )… So. Many. Choices…​Have fun! 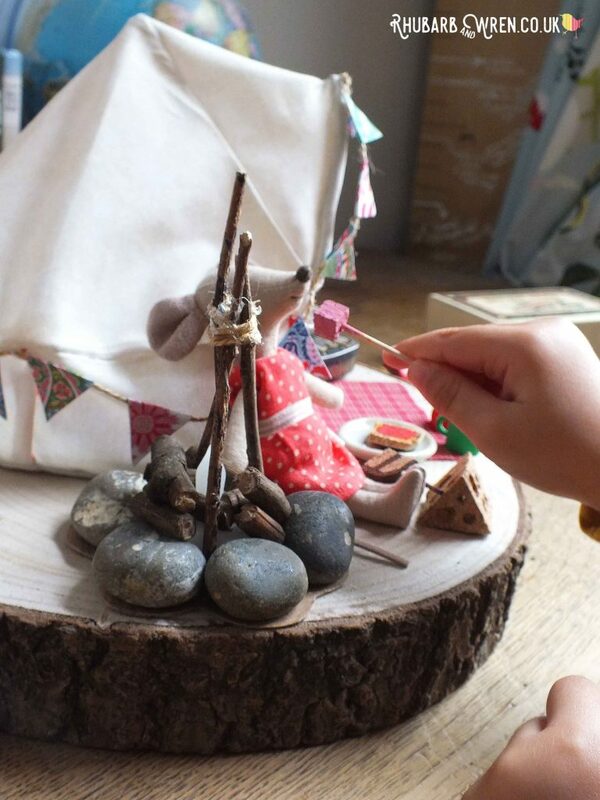 PS – if you’re looking for instructions on how to make our bellissimo toy bell tent (pictured above and in our Maileg Mouse review), they’ll be posted soon… make sure to check back! 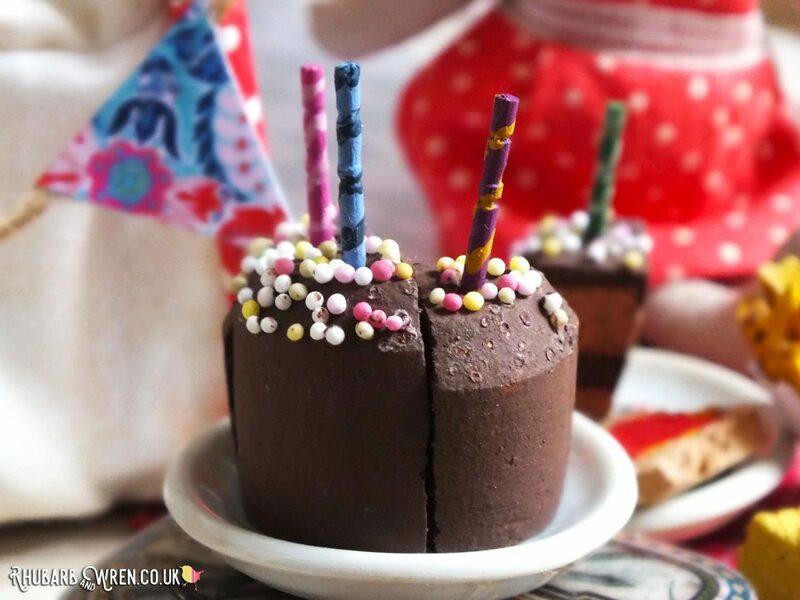 Delicious-looking toy chocolate cake made with a wine cork and real cake sprinkles! If you’ve enjoyed reading this, why not check out these other entries? 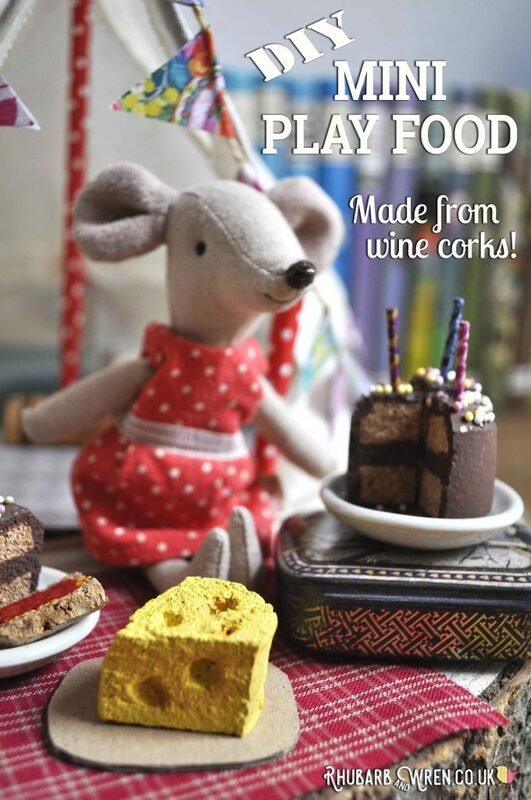 More toy food to make with corks! Dens for dolls (and other toys)! Make play picnic food for your child’s toys out of old wine corks. Craft, Junk Modelling, Learning Through Play, Plastic Free, Recycling. Bookmark. I LOVE this and will definitely be saving my corks. An excuse to buy more wine? It’s for the kids – you’d be a bad parent not to! Wow! I love these, may have to drink some wine and make for our Smurfs, a new favourite in this house! It would be rude not to… a Smurf’s got to eat too!